I regret not living closer to Den Haag where my friends run the American Baking Company. Their desserts are delicious! I got to enjoy some of them this past Saturday when I went to help them out with a project. 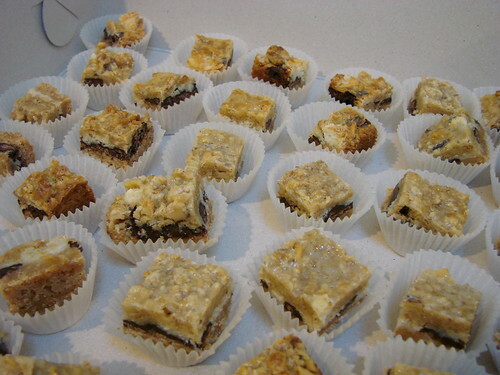 They kindly sent me home with some freshly made cinnamon buns, a mini cupcake, and some Hello Dolly bars. Every bite was fantastic! I saw some of their other treats on offer at the Coffee Company in Den Haag and I regret not buying some red velvet cake and cheesecake to bring home with me! So, if you’re in Den Haag or in Amsterdam on Sunday afternoons near the Sunday market, go look for American Baking Company. You won’t regret it! The other evening, we were talking with a friend who is a university student. He was telling us about an exam he took for an American politics course he was taking. The course seemed to be an overview of the basics of the government system, along with how it has been used over the years, politically and culturally. I think they covered everything from Thanksgiving and battles with the Native Americans to Vietnam and the shifting morals through the 1990s and today. I learned two things in discussing this exam with our friend. One, you can take an exam over at the end of the summer here if you’re not sure you did well enough the first time around. I would have liked that option on a few end-of-year exams when I was at university. Two, I realized that despite being an Amerikaans Burger (American citizen. No, really! Burger, in Dutch, means citizen! My ID card says Amerikaans Burger on it! ), I would probably not have passed this exam. It’s not that I don’t know my own history; I know my fair share and did well in my US History courses, but when it comes down to being tested on specifics, it’s easy to realize just how much information we forget. There were also whole sections and essays on My Antonia, by Willa Cather, a book I’ve heard of, but never read. I almost feel like I should read it now. My friend said not to bother. 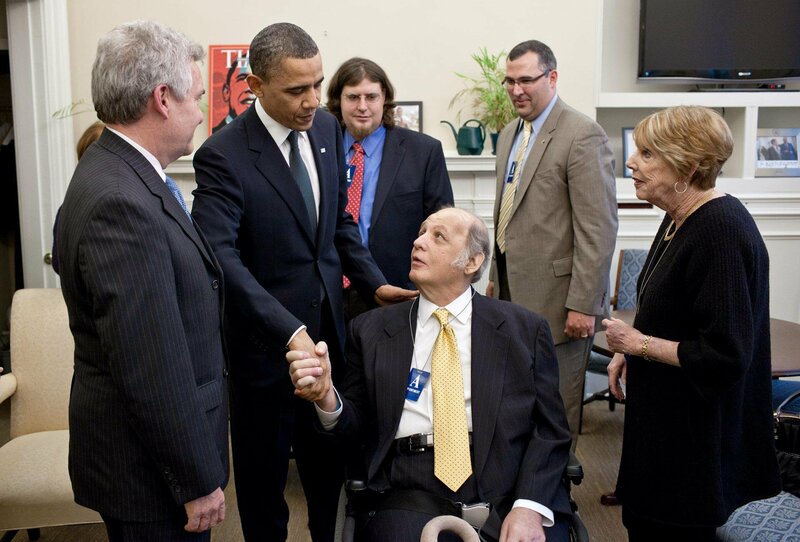 A bit of history I do remember is the attempted assassination of President Reagan and the toll it took on James Brady, Reagan’s Press Secretary. He was one of three people shot and was permanently disabled, as a result. He has since become a strong proponent of gun control. On March 30 this year, he was invited to the White House for a meeting with Press Secretary Jay Carney on the 30th anniversary of the shooting. While there, President Obama joined them all briefly. If you’re wondering why I’m posting about this, it’s because of the gentleman in the background in the tan-colored suit. He’s a friend and fellow Tulane University alum. We didn’t know each other at Tulane — I think he started the year I graduated — but we met when I was living in NY and attended the Tulane alumni meetings. He was very active in the NY alumni branch and is just an all-around nice person. He’s now in DC, still active in Tulane alumni work, but also working to secure greater gun control. It’s nice to see a friend and fellow Tulanian doing good work. Pretty cool that he got to meet the president, too! And in honor of all of this, we’re having burgers for dinner tonight, hopefully grilled outdoors to take advantage of the lovely weather! Enjoy your weekend! For once, I’m going to suggest that you go to Amsterdam if you’re within travelling distance. Specifically, go this Sunday, 6 March, to the Sunday Market (Cultuurpark Westergasfabriek,Haarlemmerweg 8-10, 1014 BE Amsterdam). Once there, go visit the booths of solohandmade and American Baking Company. You won’t regret it. For one thing, you can buy beautiful necklaces like the ones in the above photo. Those are both ones I own and adore and wear regularly. 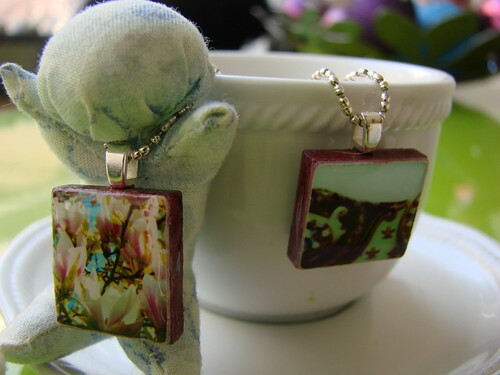 Kerry, who is the solo handmaker, takes some of her beautiful photos and turns them into mini necklaces. She also makes various “pretty and practical” things, such as coasters, pillows, hair clips and more. You can see and order her items on her etsy shop. While you’re wandering around the market, you may get a bit hungry, or maybe you will be looking for a little something sweet and delicious as a pretty end to your weekend. In that case, go check out American Baking Company. 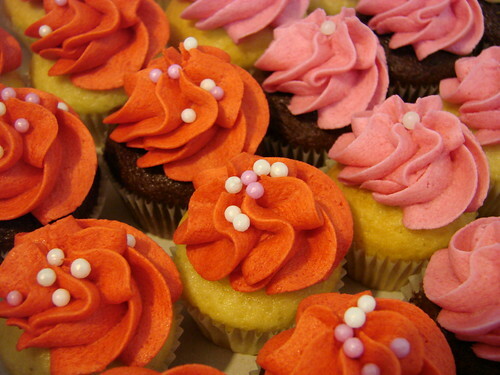 Based in Den Haag, they make the most divine cupcakes and other treats, such as pies, bars, cookies and cakes. They’re also absolutely beautiful to look at, but once you take your first bite, you’ll be too busy inhaling them to stop and look any more. Seriously, buy more than you think you’ll want, because once you’ve eaten the last one, you’re going to want more. They’re truly addictive. Fantastic flavors, moist cake, and frosting to die for! They also do fantastic traditional American flavor combinations, including peanut butter and jelly, and peanut butter and chocolate. Amazingly enough, considering the Dutch do eat chocolate and do eat a fair amount of peanut butter, they don’t put these two great tastes together! Fortunately, ABC is doing it’s job to spread the wonder of this flavor combination. 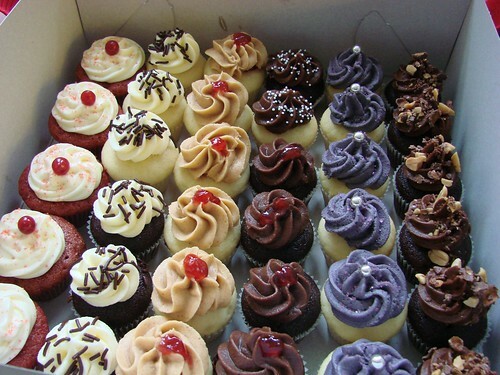 They also have a delicious red velvet cupcake with wonderful cream cheese frosting, and all sorts of other flavors. So go. Enjoy. And say hi for me. The people involved are my friends, but they’re also truly talented and wonderful people and I’m promoting them here because I want everyone else to see their work, because it’s truly fantastic. It’s been a quiet week for me. Not much going on except for THE NETHERLANDS MAKING IT TO THE FINAL ROUND OF THE WORLD CUP!!!!!!! But yeah, other than that, fairly quiet. Not a lot of photography going on, either, other than a few shots of the cats and last night’s dinner. I did take this shot on Saturday, while I was hanging out on the Vismarkt on the Oudegracht with Kerryanne and Ken. The conversation was excellent, but when I saw this glow, I couldn’t resist taking a quick shot. This is around 9:30 pm and after a very rainy start to the evening, seeing this dazzle seemed a perfect cap to a great meetup with friends. The light definitely mirrored my mood! Happy birthday to Ken and happy travels to Kerryanne. May your days be sunny and beautiful! 1. Why did you start your blog? Did you expect it to become popular? 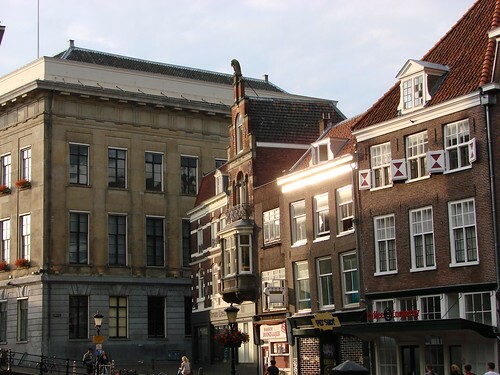 I started it mainly as a way to keep my family and friends up to date with my new life here in the Netherlands. Of course, I’m not sure how many of them actually read it that often. 😉 Fortunately, a number of other expats, as well as Dutch natives, and others as well, do seem to read my blog. I don’t know if it’s particularly popular, but I enjoy it and have been fortunate to have met some people through it. I was a bit shy about meeting people when I first started, but I’m getting much more comfortable with it now. I’m even meeting a few more people this upcoming weekend! I think blogging can help you adjust to a big move like this, because you find others going through similar things and you get a chance to track your own development and adjustment. 2. When exactly did you start your blog? This is the question I’ve also been curious about recently. I knew my blog’s two-year anniversary must have been recently, since my two-year anniversary of living here has just passed. It turns out my first blog entry was June 1, 2008. Such a boring entry, but as I said, I really did start my blog as a way for family and friends to know what I was up to, and see photos of my new city. That Utrecht set of photos on Flickr has grown exponentially! 3. Who are three of your most loyal followers? I’m sure there are plenty of loyal followers whose names I don’t know, since they read, but don’t leave comments. I notice certain repeat visits from various cities and countries in my Feedjit feed over on the right. I always get such a thrill to see some of the far-flung places from which people arrive! As for followers who comment, I’ve gotten a nice little group whose regular comments are always appreciated! I’ve recently had the pleasure of meeting Kerryanne from 3continentfamily and I’m so glad I can now count her among the expats I’ve gotten to know in person. She’s a joy to know and the conversations and comments are always interesting. In about a month I get to finally meet Ken of My Dutch Fairytale. His writing has had me wiping away tears of laughter, while also making me want to bow down in reverence for some of the things he has experienced and accomplished. I always enjoy his comments, be they here, in e-mail or on Facebook. There are many others and I hate to leave anyone out, since I truly appreciate everyone who both comments or simply reads my blog. Thanks for sticking around! If you want to do this too, feel free! 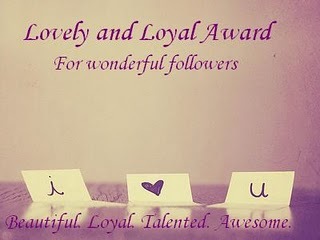 I figure if you read my blog regularly, you deserve this award! A slightly different shot from my usual stuff — more people! I went to another TweetUp last night and we started the evening off at Café Olivier, a Belgian beer bar located over by the Hoog Catharijne. I’d seen the outside of the café before, and even taken a few photos, but I had never been inside and didn’t realize it was actually a converted church. 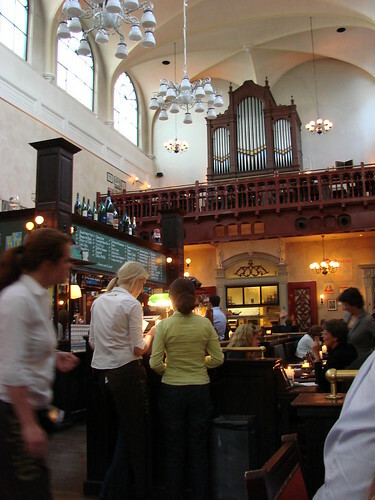 It’s lovely inside, as you can see, and they have a massive selection of Belgian beers from which to choose. I really must go back again soon and maybe have a bit more time to focus properly on the large menu of beers. As it is, I had a great time catching up with people I’ve met before, while finally meeting others. Everyone was lovely and as always, I thoroughly enjoyed the evening and look forward to seeing them all again. You know how each wedding anniversary supposedly has a different type of gift associated with it, such as paper, wood, silver, or diamonds? Well, perhaps there’s a similar gift symbolism for expat/immigration anniversaries. 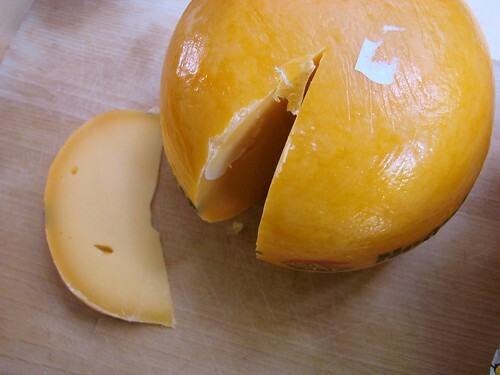 If so, it would seem that cheese is the two-year anniversary gift. On Friday, when we went to the Potdeksel to meet up with some friends, they surprised us with that lovely wheel of cheese you see. 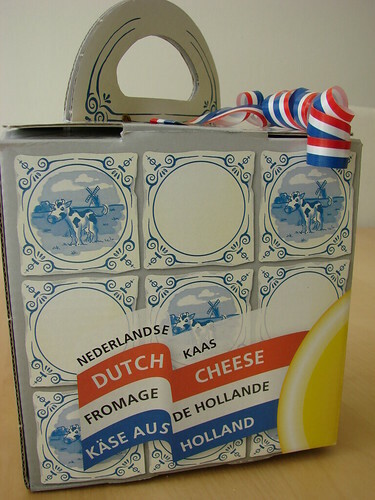 It even came in a charmingly Dutch gift box. 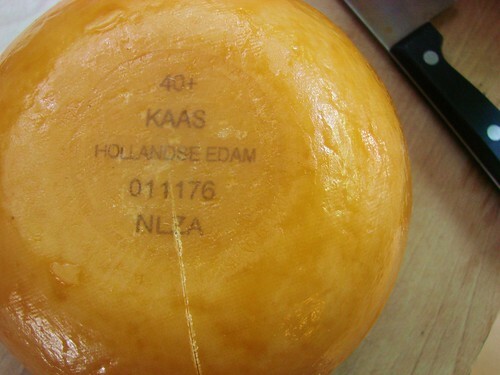 It’s a delicious wheel of good ol’ Hollandse Edam, looking quite official with its stamps and identifiers. Most importantly, though, it’s delicious! Heerlijk! 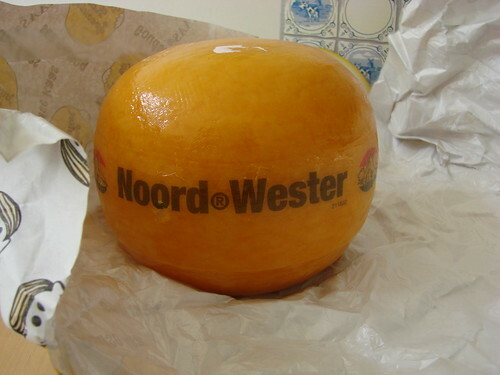 Lekker! Two years ago today I came to the Netherlands for the very first time — and haven’t left yet! Our plane arrived early in the morning on May 28, 2008, and after a bit of confusion with the car rental and a short soak in the morning rain, we left Schipol and headed down to Utrecht. I had never been to The Netherlands before that day, other than a layover flying back from Italy to the US, and that time I never left Schipol. A bit mad, perhaps, to move to a country you’ve never even visited, but I do have my moments of madness. I trusted G, who had been here quite a few times for business and to find us a house. I’ve found that I’m generally pretty happy wherever I live, so I figured this wouldn’t be much different. Fortunately, I was right. I’ve been very happy here these past two years and don’t regret the move at all. 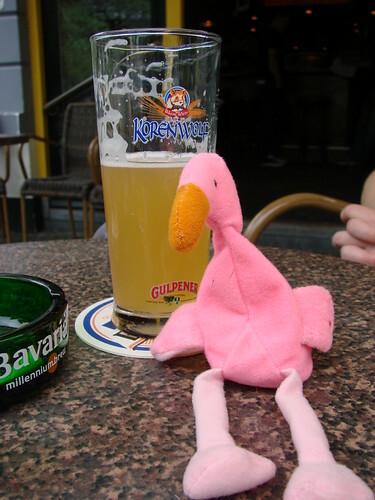 This photo of Orlando, my flamingo, was taken later that first afternoon when we went to the Café de Potdeksel for an afternoon drink on the terrace. G had learned about the café from the couple who sold us the house; they had taken him there after the house closing to celebrate and introduce him to the family that owns it. We were incredibly lucky to buy the house from such a kind and friendly couple; their friendship and help has made our transition here much smoother and happier. They’ve also introduced us to some of their other friends, helping to expand our little social network. We’ll be seeing some of them tonight at the Potdeksel and I’m looking forward to it as always. Thanks to this blog, I’ve also made some friends of my own this past year, as I’ve gotten to know some other fellow expats. I’m even meeting up with a few tomorrow night for drinks; keep your fingers crossed that the rain holds off tomorrow night! Have the past two years been nothing but sunshine and roses? Of course not, but that’s just life. Nowhere is perfect, but in general the good has outweighed the bad and I’m very happy here, content to stay for many more years. … Otherwise known as Dictionary Wednesday. Thanks to Mer for the suggestion. I’ll try to do a post each woensdag about some Dutch word or phrase that I’ve recently learned or found amusing or interesting. Melissa asked how I get along with the Dutch language and I must be honest and say that my Dutch isn’t so hot. I don’t have to go through the integration program, which means I haven’t taken language classes here. I suspect I’d get a lot further if I did; self-study can be frustrating and hard to stick with. I do want to learn, though; it’s important to me. I know I’d feel much more confident. Not being able to speak confidently is bringing out the shyness that I’ve tried to get rid of over the years. Sometimes the simplest words can be the hardest to remember or keep straight. Ironically, the words for easy and difficult are two that I’ve frequently gotten confused. It doesn’t help that they’re somewhat similar. Makkelijk (easy) and moeilijk (difficult) came up fairly early on in my studies, yet when it came time to use one of them in a sentence in real life, I’d forget which is which. Fortunately, I have Dutch friends who have been happy to help me with some of my language quandaries. A few weeks ago, I was quizzing one of my friends on some of the language questions that had popped into my head earlier that day. In the midst of the conversation, I was reminded of my trouble keeping makkelijk and moeilijk straight. Usually, I try to find some sort of word or sound association to help me, but I’d been having trouble with these. As I was thinking about it, though, I realized that moeilijk is “harder” to say as a non-native speaker. Voila! I had a word association to help me! (Hey, I’ll take an association wherever I can find one!) Does that make it easier to remember makkelijk? No, not really, but having one become easier to remember has inadvertently made it easier to remember the other. I had another TweetUp (meet-up with friends from Twitter) last night, meeting with pinkypie, ROtotheD, Pamcakes, and Melissa, a friend of pinkypie’s. 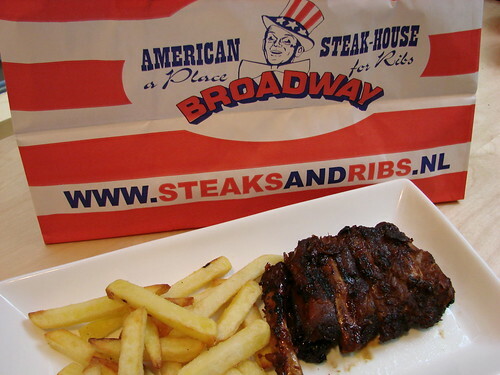 We’d gone to Stairway to Heaven last time we all got together, and this time we went to Broadway American Steakhouse Restaurant on the Oudegracht. Our goal? Ribs. Pammy had been before and said the ribs were actually quite good, so we were hopeful. That hope was not in vain. The ribs were surprisingly good! As good as the ones G and I used to make? No, but really, how could they be. 😉 They more than satisfied my rib craving — or maybe they’ve just inflamed my craving. Either way, we’ll definitely be going back, especially once the weather is warmer and drier and we can sit on the terrace right there on the canal. We probably could have sat outside last night. The day was sunny and surprisingly warm, getting up to 17C! It seemed like all of Utrecht was outside last night, with every restaurant and café’s outdoor seating filled to the brim with people enjoying the warmer temperatures. It really was a gezellig evening — friends enjoying each other’s company, laughter ringing out, and the glow of table candles lighting the evening in a rainbow of colors. We did eat indoors, but it was still fun and an interesting setting. 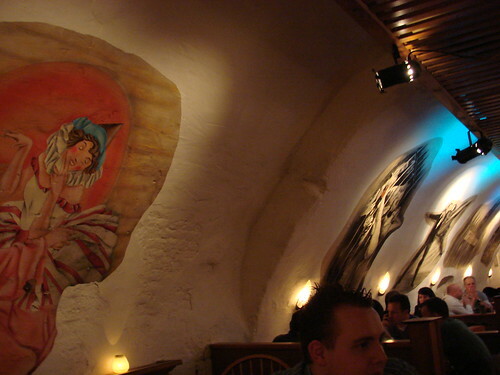 The restaurant is in one of the canal-level/below street-level spaces where the interior is filled with curved walls creating a cave-like atmosphere, without the dampness or dreariness. 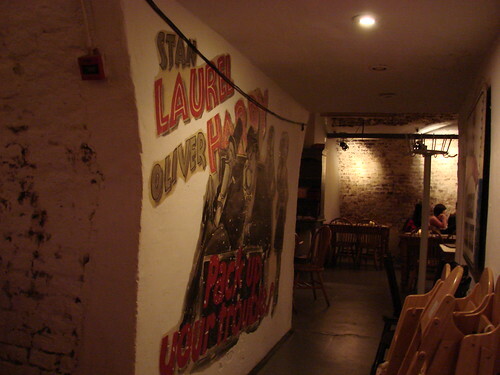 They had the walls painted with scenes from Old Hollywood, including a mural of Laurel and Hardy. The pictures aren’t that great, but that’s because they were a last-minute thought as we were getting ready to leave. The rest of the evening was taken up laughing, eating, and generally have a great time. Most of us also got “doggy bags”, since the portion sizes were also American. What you see in the top picture is the ribs that I had left and brought home for my lunch today. The dinner also came with patat/frites (French fries) and we got some cole slaw to go along with it all. Even the cole slaw was excellent, although we partly attributed that to the use of Dutch mayonnaise. All in all, it was a great night with great food and great company. Can’t wait to do it all again!